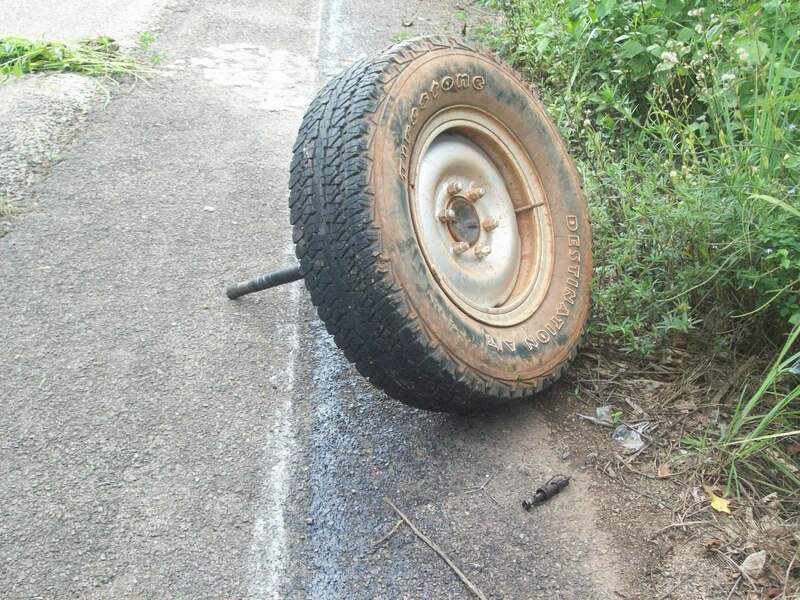 Yesterday we were driving from Kumbo to Yaoundé and just east of Makenene the driver’s side rear axle rod along with the tire and wheel broke away from the car as we were driving at 80 kmh (50 mph) down a hill. Initially I thought we just had a flat tire but seeing a tire rolling down behind me in the side view mirror, I realized it was more than just a flat. I pushed on the breaks and had a difficult time stopping since I only had 3 wheels, but down shifting the car I ended up stopped on the opposite side of the road. Thankfully there were no cars coming, as the car came to a stop on the only side of the road that even had a partial shoulder. As I got out of the car to assess the damage I quickly noticed that the tire was nowhere to be seen and that it must have went off the road into the densely over grown rain forest. 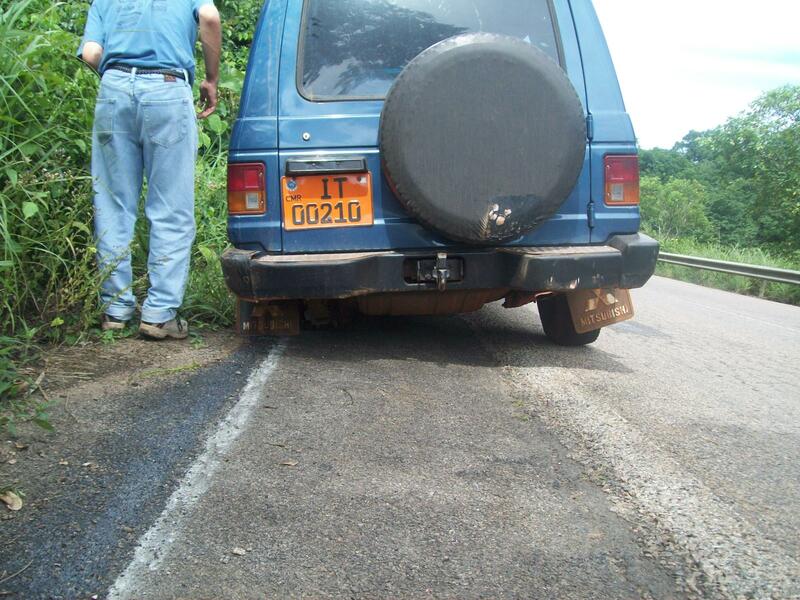 But, before I was able to say, “Where did the tire go?” two Cameroonians that where driving behind me on a motorcycle hopped of the motorcycle and climbed down the ravine to look for the missing axle and wheel. Before they were back a second car stopped and this man was on his way home and he was a mechanic and he asked us if we needed any help. 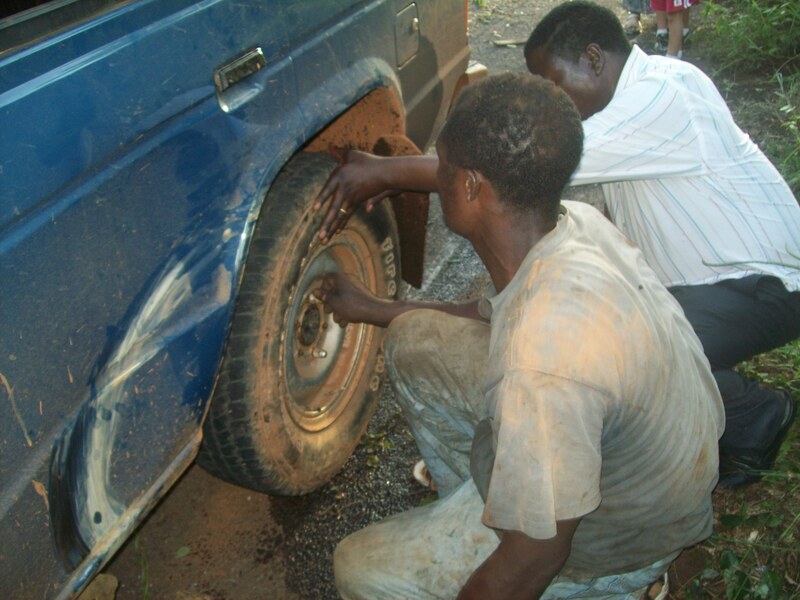 So as the first 2 Cameroonians climbed back up with the wheel and axle the mechanic asked for the jack to lift up the backend of the car. We are borrowing this car and when we looked we were unable to find the jack, so he went and grabbed one out of his car along with a few tools. After looking at the damage and the brakes that had been used as a ski to bring the car to a stop he thought that he could get us going again. I was still trying to think how I call a tow truck in Cameroon and how far are we from the next town where we can take a bus back to Yaoundé. 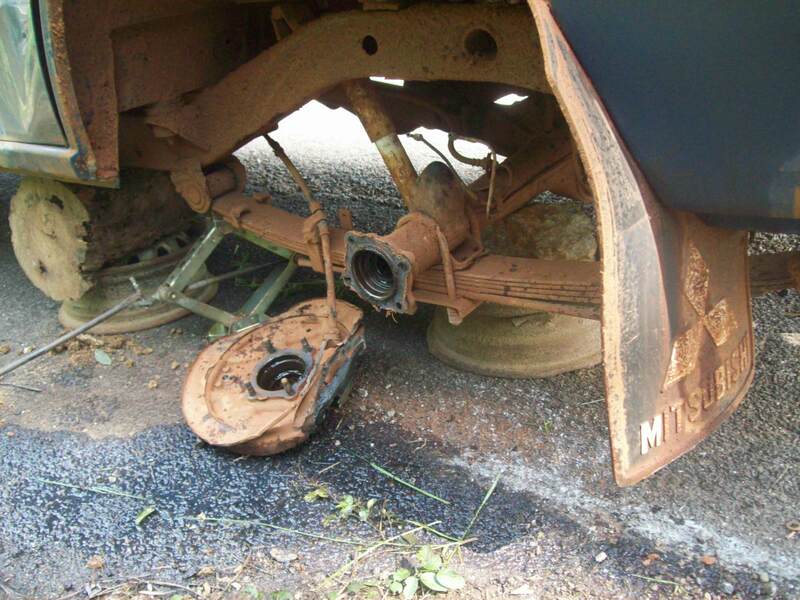 After pounding the pan that held the brake drums back into a flat circle he said he was going to need to go weld something or use a power tool, I didn’t quite get exactly what he was saying, just that he was going to have to take the axle to the town we just drove through and fix it, 25 km away. He came back an hour later with the “fixed” part. Later I found out that the place he had to go only had their power restored 5 minutes before he arrived. As he installed the axle and tire back on the car and disabled the rear drivers brake so it wouldn’t leak any more fluid he was able to fill up our brake fluid, which I had a full container of in the car. He then took the car for a quick test drive up and down the road and told us we would have no problem driving the vehicle back to Yaoundé 160km away but just don’t drive over 80 kmh. So just after 4 hours of losing a critical part to the car we were back on our way. This morning as I read my Bible I read Psalm 5 and thought back to our prayers with our friends before leaving for safety and protection of the tires before we left. “In the morning, O LORD, you hear my voice; in the morning I lay my requests before you and wait in expectation.”(Psalm 5:3 NIV) I have to admit I was not waiting in expectation to see how God was going to answer our prayers but his protection was miraculous and even our tires were protected from the accident. God is GOOD! 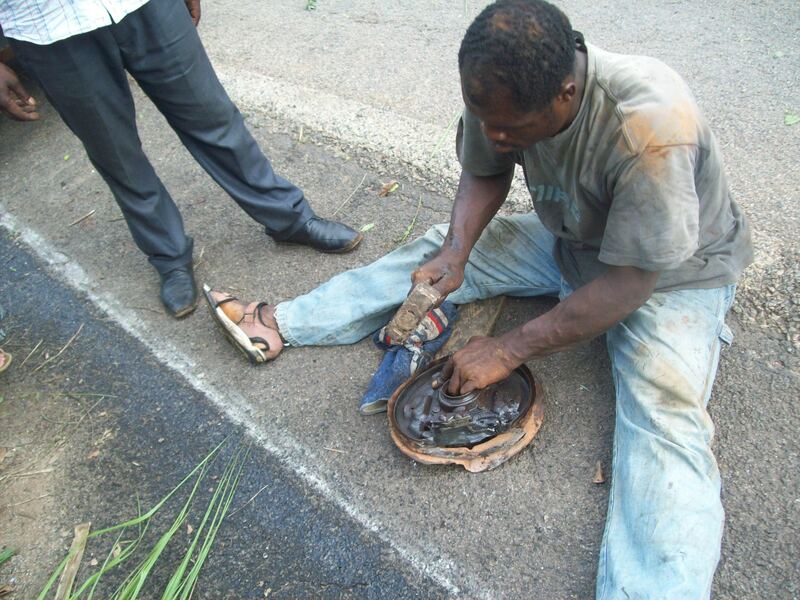 This entry was posted in Cameroon, France and tagged Accident, Cameroon, Prayer. Bookmark the permalink. It’s just one adventure after another. So glad you are all safe. I’m guessing that’s the first time you ever had a tire just come off while you were driving? 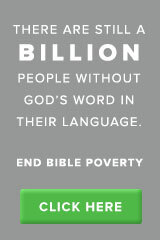 God is so very good! Yes that would have been the first time a tire came off while I was driving. I’m still waiting for the mechanic here in Yaoundé to tell me what caused it and what we can do to keep it from happening again. One of the gardeners told us he remembers when the first family that used that vehicle purchased it 21 years ago. I gave him 15.000 fcfa for parts when he went to weld the axle ($30) and after the four hours of working I asked him how much for his time and he asked for 20.000 fcfa ($40). He also gave me his phone number and told me to call him if I didn’t make it all the way home. That is good. Always good have a good mechanic handy. Especially where you are at.